The curtain is set to rise on a new era in performing arts at Dalhousie. The Performing Arts Campaign will create a modern, world-class performing arts destination for our students and community. Now is your chance to be a part of our campaign as we launch Fill the House – an opportunity to name a seat in the Joseph Strug Concert Hall. We invite you to celebrate a loved one or special milestone and demonstrate your appreciation for the performing arts in this beautiful new performance space. 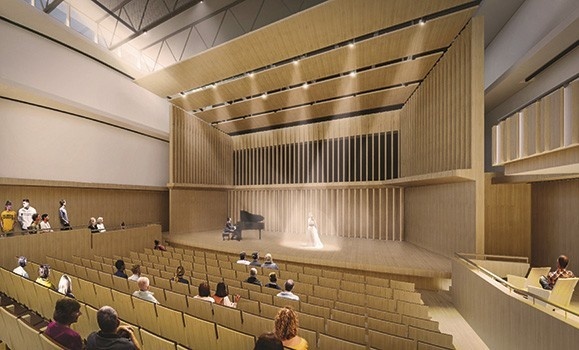 The concert hall is a key addition to Dalhousie’s Performing Arts Campaign. Featuring state-of-the-art acoustic design, the 300-seat venue will enhance the student experience by giving them an inspiring space to rehearse and perform. It will also provide a performance hall for up-and-coming local talent, national music festivals and internationally acclaimed artists. Helping us create a full house is the best way to show your appreciation for performing artists. Make a gift today to name the best seat in the house!